HINT: It looks like you may need to upgrade your local SQL Server client to resolve issues with SQL Management Objects. Search Microsoft site for "download Microsoft.SqlServer.SqlManagementObjects"
I suppose there's nothing wrong with SMO because if do the same for a stored procedure, its creation code is retrieved without any errors. it tries to connect to the server using the name the server reported back upon establishing the connection, instead of its IP (or the name associated with that IP in the hosts file), that is, the way the connection was originally made. Using the name would work if the server was on the same network as the computer running SA but that's not the case here. Actually, I'm connected to several servers, each having the name GFSQL, but each having different IPs. Cannot find source code for [dbo].[Adatblokk]. Check the "DDL Code (MSSQL)" query in SQL Assistant Options. I'm pretty much stuck with this here and still have to use my home-brew scripts and snippets to retrieve table DDLs. Sadly, those are not the most reliable either but at least do retrieve something. Could you fix this, please, or provide a viable workaround? I remember a batch file that could be configured by hardwiring server name, user name and password but besides that obviously being a security issue, it's also painfully slow to edit that file over and over again. I have to admin/develop on dozens of servers and doing it this way would be slower than ditching SE and using SQL Server Management Studio instead, and I don't want to rant about it, but SSMS is, well, rubbish compared to SE, at least performance-wise. The screenshot shows two names. #1 is used to connect to the SQL Server. This could either be a name or an IP, what you can see in the picture is actually an alias to the server's IP, stored in my hosts file. #2 is displayed after the connection has been successfully established. I guess this the reported by the SQL Server itself, and that this is the name of the Windows machine the SQL Server resides on. This also could be used as #1 in case the two machines (the client with SA + SE on it and the one hosting the SQL Server) were on the same network, which is not the case here. I don't know the exact details as they are hidden behind a benevolent shroud of mystery, but the relevant part is that the network the SQL Server is on is connected to mine through a VPN connection, and I cannot reach the SQL Server machine using its name. To make things even more complicated, there are several other networks from different clients, all connected through VPN, and all sporting SQL Servers with that very same name, GFSQL, so the name is ambiguous. But that makes no problem, the servers are connected to using their IP, which is unique (and they have their alias in my hosts file so that I can avoid memorizing tons of meaningless numbers). I think I got it first time. That's why I suggested to remap in the host files #2 to #1. I would try adding two entries, one for the machine name, whatever is returned by SA"s Context query and another for the IP address to remap it too. This way you can make the client to connect to whichever endpoint you want to send it too instead of endpoint it wants to connect to. SMO runs on the client side, this is just a kind of client side API for SQL Server Management . No, no, no, you're missing essential details. #2 is what's returned by SA's Context query, namely, the machine name. I think that's clear to both of us (or I hope I get it correctly) so we can ignore that. Except , and I cannot ignore this one, that I have multiple servers that return that same server name on Context query. Meaning that I would have to remap multiple IPs to the same alias (already being mapped to other aliases as well), which not only makes no sense but is sadly not forbidden in hosts file. Instead of complaining about duplicates or asking "er, well, which one of the 14 GFSQL mapped in hosts do you want to connect exactly?" that darned thing simply returns the first match. This would require constant monitoring and editing the hosts file to check and assure that the aliases are pointing where they're supposed to. I can understand that this might not be an everyday scenario for all the developers and dbas out there but I hop these servers several times a day, sometimes in a single hour, and this is a crucial factor to me. I doubt I'm the only one, though I might be wrong on that one. Nevertheless, critical mistakes can be made this way. SMO runs on the client side (which was pretty much the only thing I knew about it), and as you stated, being a client-side API means that something is calling its interface, orders it to connect to the server and passes parameters that tell it how to connect to the server and what to do once connected. In my opinion, the problem is that this "something" tells it to use #2 instead of telling it to use #1. Making it use the same connection parameters as SA/SE (if that is possible at all, of course) would be a real fix to this issue. Messing with the hosts file is just a workaround, and a very bad and dangerous one, too. Ok. I got it wrong. The default context query isn't helpful and that's the root cause of the issue as far as I can tell. We need to customize it somehow for your situation so that it returns a real endpoint or correct alias instead of non useful server name as reported by ServerProperty. If SA can connect to the server, SMO should be able to connect too, we just need to feed it the correct server IP. Now the question is how to get the correct IP from server settings instead of the server name. Maybe SQL Server has a system function supporting just that, or from the performance views we can extract connection endpoints and their IPs. Maybe it can be somehow passed via custom connection properties in the saved connection profile. But in the end, what comes out of Context query is passed to SMO. What you say is interesting. I don't think SQL Server has system functions for this, and even if it has, VPN might add to the confusion. I mean because of it one might see another IP than the SQL Server thinks it is. DB Queries use a bunch of different variables prefixed with a colon. Is there any that refers to the original connection property and could be used in this role? Or can anything be fetched from custom connection properties pushed into Context query? I'll explore this further. Might prove to be a solution. you only get IP addresses if you're connective via TCP/IP. If you're local and using Shared Memory then those attributes don't exist. Of course, the party could still get ruined by VPN, but that's SA-unrelated, and I'll handle it myself. Thanks for the hints, it's great to see this feature finally working for me too. Yes, this seems to work properly. Let me ask though, why is SMO feeded the thing returned by the Context query instead of the connection properties SA uses to connect? why is SMO feeded the thing returned by the Context query instead of the connection properties SA uses to connect? The code generating DDL is kind of abstracted from the connection. 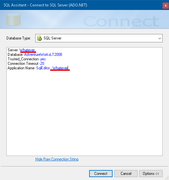 Moreover, the connection can be shared with the host application, for example, in case of SSMS, the only thing it knows about the connection is its pointer to the internal connection COM object or connection handle. It doesn't know what was entered in SSMS connection dialog. That's why part of the Context query is used to retrieve the server name SA is connected to. The same applies to other database types and editors. When it comes to the point of DDL generation, it doesn't have the details for connection parameters. Here is what I found out about passing additional parameters via connection string after reading https://docs.microsoft.com/en-us/dotnet/api/system.data.sqlclient.sqlconnection.connectionstring?view=netframework-4.7.2. If you append to Application Name the alias of the server that you want SMO to connect to, and then extract it in the Context query, basically replace SERVERPROPERTY(''ServerName'') with your custom code to extract the alias name, you can return the alias name that you want SMO to connect to. Please see my screenshot below. Please let me know if you need any additional information. I ended up with a rather ugly solution. I defined a table variable, filled it with (IP, alias) pairs, retrieved the alias by matching it with IP fetched from the server using CONNECTIONPROPERTY('local_net_address') and coalesced that one with the IP reported as second and ServerName as last. This means that I practically raped the Context query. Your solution is much more elegant and moves the tinkering where it should be done: to the connection properties. I'm going to adapt it to my needs and keep mine as a plan B. Or C.
Again, thank you very much for your help, it is much appreciated. EDIT: I added a slight enhancement to this. Since sys.dm_exec_sessions is not available on versions 2k8 R2 (and prior), I'm going to use the function APP_NAME(), which luckily is. Thank you. I'm glad we have found a workable solution for your network setup.